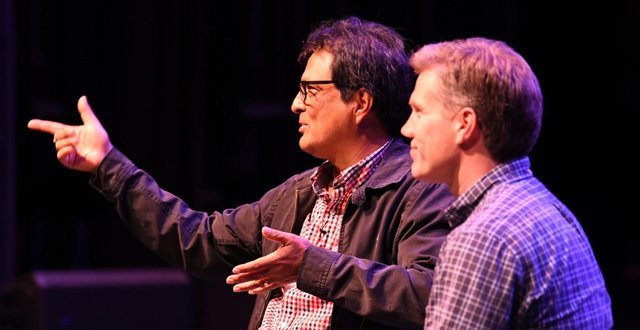 Frank Ordaz spoke to JA’s Upper and Middle School students in chapel while visiting Mississippi to create a documentary of his journey as an artist and Christian. “I knew I was an artist by the time I was 7 years old,” he said. He painted the worlds of “Star Trek,” “Star Wars,” “E.T. the Extraterrestrial,” and many more before God invaded his galaxy with the gospel of grace. “Non-Christians want to see authentic Christians,” Ordaz told students. “They are looking to see if you walk as Jesus did.” He experimented with world religions, but when he met a true follower of Jesus Christ everything changed. The man whose faith inspired Ordaz’s was a reputable sound engineer in Hollywood, but it was his humility that earned him respect and brought the gospel to life for Ordaz. Ordaz describes his former self as extremely arrogant, but now he displays the same humility that first drew his attention to Christ. He graciously shared wisdom gleaned from his experience with students who are interested in working in the arts. He told students that to truly thrive as a Christian artist you must have a good support system, and be excellent at what you do. After working as a matte painter for the movies, Ordaz went on to work as an illustrator. At the request of former first lady Barbara Bush he created the artwork for the 2006 White House Easter Egg Roll. In 2011, Ordaz returned to his first love: oil painting. His fine art landscapes and portraits are sold through shows he attends and his own venue in Auburn, California, where he resides with his wife Jana. The couple has two sons. JA parent Anthony Thaxton met Ordaz at a Christian arts workshop where Ordaz invited Thaxton to help him share his story. In the three years since their first meeting the men have filmed in California, Mexico, and Mississippi and have become dear friends. Ordaz’s story includes the flamboyance of Hollywood but is ultimately a story of how one man’s humble faith set another free to discover his true Father and, through knowing him, his identity and purpose.